As the Seattle City Council’s SR 520 special committee meets this Monday to hear an update on WSDOT’s plans for the western portion of the new bridge and its connections to surrounding neighborhoods, the release of a report on public feedback shows overwhelming support for redesigning portions of the project to incorporate better pedestrian and biking elements. Meanwhile, the Cascade Bicycle Club and Central Seattle Greenways have delivered what the groups call “a gift of overwhelming community support” to push for pedestrian and biking improvements in the designs. 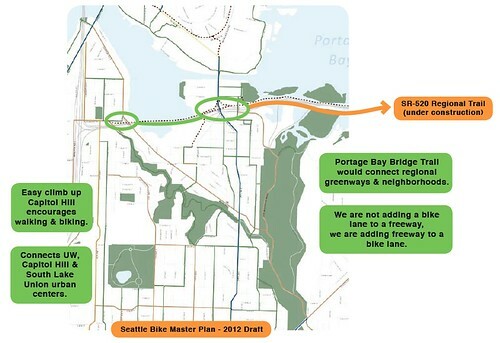 » Over 1,000 comments in support for the14-foot regional shared-use path along Portage Bay Bridge. » Support for dedicated bicycle and pedestrian paths with direct, convenient and safe access to main intersections, neighborhoods, and existing trailsthroughout the project area. » General concern about bicycle andpedestrian connectivity and safety inand around the Montlake lid area and on Montlake Boulevard. Portage Bay Bridge Trail: 1298 out of 1339 commenters in support continuing the 520 Bridge regional trail from Montlake to Roanoke and I-5 via the Portage Bay Bridge. That’s 97% consensus. Montlake Blvd: 1028 out of 1102 commenters support improvements to pedestrian, bicycle and transit improvements along both sides of Montlake Blvd. That’s 93% strong. Bike/Ped Crossing at I-5 & Roanoke: 1146 out of 1245 commenters favor a 30-foot wide pedestrian and bicycle bridge over Interstate 5. That’s 92%. CHS has reported on the opportunities to improve the 520 designs for non-motorized transit over the past year as WSDOT’s design process has played out. While there have been pockets of opposition from those living nearest the project, others have championed the cause of transforming the state project to do more than just create more lanes of traffic across Lake Washington. Following Monday’s hearing, the Council has until January to pass a resolution stating its design preferences. The Seattle portion of the project also requires a plan to come up with $1.something billion to pay for it all. The good news on that front is WSDOT’s estimates continue to drop. We’ve embedded the main document from Cascade below as well as an overview of changes being sought for the Montlake Lid area of the designs. This doesn’t directly mention it but I recall that the preferred alternative had the area between Roanoke and Delmar capped with some type of bike access to the Portage Bay bridge. Is that cap still in the plan? I haven’t been able to figure out if it is or not.